FDA approves new flu medication. A new flu medication, Xofluza, in the form of a single dose pill, has been approved by the FDA this week. When taken within 48 hours of infection, the duration of the flu can be reduced by one day or more. It is hoped that this new drug will reduce infection rates–the 2017-2018 flu season, saw 900,000 hospitalizations and 80,000 death– the worst season in 4 decades. Xofluza works by blocking an enzyme, and stopping replication early on. Safety tests involving rats and rabbits and were instrumental in bringing this new drug to market. Anti-aging drug cocktail extends lifespan. New research in C.elegans, exploring combinations of drugs with anti-aging properties has identified a cocktail the maximizes “life-extending” effects. The cocktail involved three compounds, rapamycin, rifampicin, and allantoin. 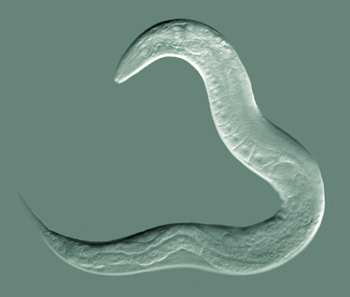 When administered the life-span of C. elegans was almost doubled. A similar effect was also replicated when studied in fruit flies. While there is still a great deal of research to be done here, the hope is that this means it is much more likely that similar results could be seen in humans. Published in Developmental Cell. Consumption of alcohol hijacks memory pathway, facilitating cravings. A new study in fruit flies has found the alcohol consumption, hijacks a conserved memory pathway in the brain and changes which versions of genes are made, forming the cravings that fuel addiction. The team used genetic tools to selectively turn off key genes while training the flies where to find alcohol. This enabled them to see what proteins were required for alcohol reward behavior. One of the proteins affected was Notch, which downstream, also affected the dopamine-2 like receptor responsible for encoding whether a memory is pleasurable or aversive. Specifically, alcohol consumption affected the type of the protein made by the dopamine receptor highlighting the molecular underpinnings of cravings. Published in Neuron. Treating jellyfish stings with science. Jellyfish are some of the most dangerous creatures of the sea, and account for 100 deaths per year. Although these animals are dangerous, there is little evidenced-based treatment on how to treat a jellyfish sting. A scientist–Angel Yanagihara–based at the University of Hawaii, however, has isolated the venom and determined the mechanism of the sting–microscopic cnidae. With this new information she has determined that rinsing the wound and submerging it hot water between 108 and 113 degrees fahrenheit for 45 minutes is best. Thus, leave the meat tenderizer at home and avoid urinating on the sting; vinegar and hot water is the only evidenced-based treatment. New therapy delivers oxygen to hypoxic tissue. In conditions of low oxygen or hypoxia, a number of physiological changes occur affecting human health. Current treatments which involve hemoglobin-based oxygen carriers (HBOCs), are not without side effects, including bio-accumulation to toxic levels. HBOCs are also not specific, releasing oxygen too quickly, and not in hypoxic regions. To combat this, researchers created a new drug, OMX-CV, which selectively releases oxygen in hypoxic areas. Moreover, in a lamb model, OMX-CV, was shown to be effective in reducing hypoxia in cardiac tissue but without the toxic effects of HBOCs. Published in Plos Biology. Posted on October 26, 2018 October 26, 2018 by EditorPosted in News, Research RoundupTagged Alcohol, flu vaccine, Hypoxia, jellyfish sting, lifespan. Next Next post: Research Roundup: Three paralyzed men walk again thanks to animal research; a promising new therapy to stop Parkinson’s disease and more!